Effective blend of the best Organic oils to prevent and treat stretch-marks. A unique and supremely effective stretch mark treatment. A combination of top Organic beauty oils to prevent and reduce stretch-marks during pregnancy, adolescence or sudden weight loss. Containing 100% cold pressed extra virgin Spanish olive oil, Organic sunflower oil, organic avellana oil, Organic Sweet almond oil. These oils are all highly moisturising, nourishing and packed with vitamins A,B,E, and essential fatty acids vital for beautiful healthy skin. We also add the extraordinary Organic Rosehip seed oil which provides firming and cellular renewal benefits to your skin. 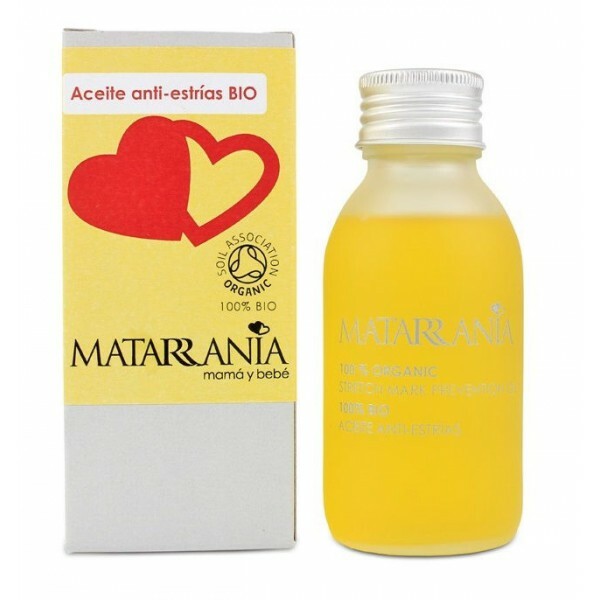 This oil also contains Calendula flower extract which is fantastic for delicate and sensitive skin. This stretch mark treatment oil is non-scented and completely safe to use during and after pregnancy. Apply few drops once or twice daily and massage using an upward motion.